This flight simulator kit comes with a transmitter (remote control) that connects directly to a computer's USB port and is made with smooth gimbal sticks. Compared to other flight simulator training softwares, this Flight Simulator Kit is the best in its price range. This simulator software is installed with various 4 CH and 6 CH helicopters and airplanes to help build coordination and polish a pilot's navigation skills. Aircraft sound and a variety of landscapes are also incorporated to provide a more realistic flight. 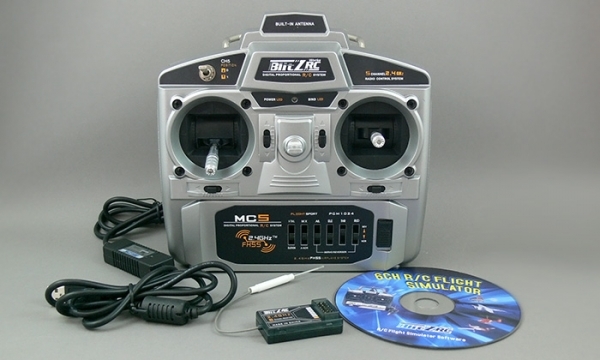 A versatile multi-purpose 2.4Ghz 5Ch radio system is supplied with this kit, permitting its use with both simulation software via a special USB cable in addition to most RC aircraft under 5 Channels.The kit includes the radio system (Transmitter and Receiver), one bind plug, USB cable, and simulator software CD. Copyright © Banana Hobby, All rights reserved. All prices and specifications are subject to change without notice. Banana Hobby is not responsible for typographical errors. All typographical errors are subject to correction.